Butternut squash is an excellent source of nutrition. We packed this baby full of quick homemade tomato sauce and cheese. 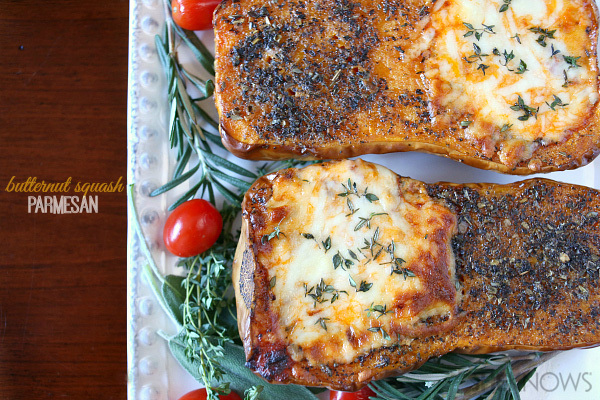 You’re going to love this meatless squash dish. Just because a recipe has the word “Parmesan” in it doesn’t mean is has to be drenched in cheese or breadcrumbs. We took the classic chicken Parmesan ingredients and turned them into a beautiful and tasty vegetarian supper. Preheat oven to 400 degrees F and prepare a rimmed baking sheet with a Silpat liner or parchment paper, set aside. Lay cleaned butternut squash onto the baking sheet and drizzle with olive oil, kosher salt, pepper and Italian blend seasoning. Rub all over the flesh of the squash and let roast for 1 hour until soft when pricked with a fork. Remove from the oven and fill the cavity of the squash with equal amounts of tomato sauce and then top with both cheeses. Bake for about 15 minutes longer until the cheese is melted and lightly browned. Sprinkle the hot squash with fresh minced thyme and sage. Serve hot. In a large skillet over medium heat add olive oil. Once hot add in onion and saute until soft and translucent. Add in garlic and cook until fragrant. Add in crushed tomatoes, Italian seasoning, sugar and salt. Simmer, stirring occasionally, over medium heat until the sauce is thick. Taste the sauce before serving. If the flavor is too acidic simply add another 1/2 teaspoon sugar.